Hangover IV Drip Hydration Treatment: Do IV Fluids Treat Veisalgia? IV Hydration drips have become the trend to get rid of hangovers. Whether one receives it in IV hydration clinics or at home, a lot of people swear by its ability to swing them back to feeling great the day after binging on alcohol. What are hangover IV fluids? Are hangover IV drips effective? How does IV treatment for hangover work? What are the most common ingredients in the veisalgia IV fluids? What are the benefits of IV for a hangover? What are the disadvantages of an IV hangover cure? What Are Intravenous Hydration Fluids? IV hangover drips, or fluids are a mixture of water, vitamins, and antioxidants used to rehydrate an individual after heavy consumption of alcohol. The goal of IV fluids for a hangover is to replenish fluids and electrolytes lost as a result of alcohol intoxication. Since the loss of these key blood components causes the symptoms one experiences after heavy drinking, intravenous fluid replacement may seem a great idea. Because IV hangover treatment delivers fluids and electrolytes directly to the bloodstream, bypassing the gut, they are considered the fastest way to get rid of a hangover. Many people also report feeling better after receiving IV fluids at home after heavy alcohol intake. However, these claims have not been approved or validated by the Food and Drug Administration or by any research study. The basis for these fluids is simple: Rehydrate an individual and replenish depleted stores of nutrients. But does an IV cure a hangover? While there are no studies to prove the effectiveness of intravenous drips, many healthcare professionals opine that these treatments are effective at alleviating symptoms following heavy drinking. A 2012 study revealed that emergency physicians in the North East of England find it effective at curing patients who were brought to the emergency room with hangover symptoms. However, other studies show that they may not be so effective at resolving symptoms. A double-blind, randomized controlled trial conducted in one urban and one tertiary emergency department in Queensland, Australia revealed that it made no difference to the outcome if people who are hungover receive intravenous saline. In this study, two groups were involved: one group of the patients who suffered alcohol intoxication after-effects received IV saline treatment while the other group was placed on observation only. There was no significant difference in the severity of symptoms, length of stay in the ER, and change in blood alcohol levels between both groups. How Do IV Hangover Drips Work? Intravenous drips deliver water and nutrients directly into the bloodstream, with 100 percent bioavailability. This bypasses the digestive system and the first-pass metabolism in the liver, which delay the delivery of fluid into the bloodstream. The hangover IV kit comprises the drip bag, a catheter, and a cannula. To receive an intravenous drip, a doctor inserts a cannula into the individual’s vein, removing the needle from the plastic quickly as soon as the cannula is secured in the vein. 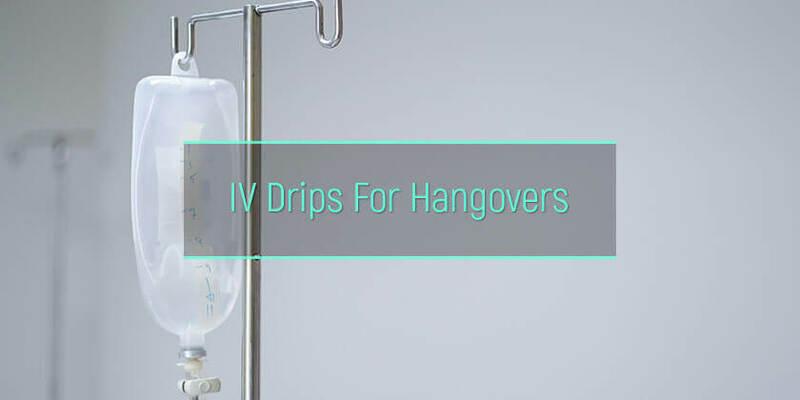 Each IV bag for hangover contains about 500 milliliters to 1 liter of fluid and are connected to the cannula to deliver the fluids. The fluid may be delivered slowly or fast depending on how dehydrated the individual is. The drip replaces the water lost from circulation and the other ingredients of the drip help relieve other symptoms of the hangover. There are different types of intravenous hangover drips on the market. However, most of these typically contain four essential components – water, vitamins, electrolytes, and glutathione. Water is the best hangover cure drink, as it keeps one hydrated, alleviating the symptoms that follow an alcohol binge. Rehydrating oneself with intravenous fluids after a night on the town also helps to cleanse blood circulation, flushing the toxins fast through the kidneys. Vitamins are also a major component of many hangover IV drips. Alcohol impairs the absorption and use of vitamins and minerals in the gut, particularly B-vitamins (vitamin B1 and B12), vitamin C, zinc, and folic acid. Although the body only requires these nutrients in small amounts, these substances play integral roles in how the body functions and need to be replaced. For instance, vitamin B12 keeps the nerves and brain cells growing and functioning optimally, and folic acid keeps the production of hemoglobin optimal. Because the absorption of vitamin B12 is less optimal if supplemental orally, replacing vitamin B12 for a hangover is best through the intravenous route. Electrolytes, including potassium and sodium, are lost during withdrawal. Vomiting and diarrhea, which are major symptoms one experiences the morning after, cause the body to lose these chemicals, leading to serious complications. For instance, a very low potassium level may cause severe fatigue as well as a cardiac arrest in severe cases. IV treatment for hangovers replenishes these stores and maintains their balance in the blood. Also to replenish these electrolytes, what to eat when one is hungover are foods, such as bananas, that are rich in these substances. Glutathione is one of the most potent antioxidants, and it is a major component of these intravenous drips. Glutathione helps to detoxify the liver, ridding the liver and the bloodstream of toxins released from the breakdown of alcohol. Intravenous drips may also contain other ingredients, including painkillers, anti-nausea drugs, and antiemetic medications. The drips deliver these medications fast into the bloodstream, relieving aches and abdominal discomfort respectively. Why receive IV drips? What advantages does it have? These are the benefits of intravenous hydration for hangovers. Intravenous hydration bypasses the digestive tract, entering the bloodstream directly and correcting the fluid and electrolyte derangements. This provides relief of symptoms within minutes. One does not need to travel a distance to the hospital or clinic to receive intravenous treatment. Just get the home IV hydration kit and rehydrate without moving a muscle. Some intravenous hydration lounges offer mobile hydration clinics to meet patients where they live. Although IV fluids contain the key components listed above, these drips also come in different compositions to meet different fluid and nutrient needs. So, one can get the drip that meets one’s specific health needs. For example, people with problems absorbing vitamin B12 in the gut may opt for drips rich in vitamin B12; people who need a boost in their muscle function may get drips rich in amino acids as well. IV hydration is administered by health care providers, keeping it safe and minimizing the risk of complications of the procedure. Although these at home IV drips may cure most of the symptoms, this therapy also comes with some demerits. There are many hangover hospitals or lounges all over the place now, promising fast relief of hangover symptoms with the best IV fluids for a hangover. However, these IV treatment facilities are largely unregulated. Hence people may have to pay through their noses just to get rehydrated. In some facilities, IV therapy for hangovers may cost between $80 and $800. Unless one is severely dehydrated, one may not need an IV drip hangover cure. However, in some of these hydration clinics, one’s level of dehydration may not be factored in. This may cause an individual’s body to be overloaded with fluids, leading to health problems such as heart failure and cerebral edema. Saline IV hangover fluids may also deliver salt to the body, which may be detrimental to an individual diagnosed with hypertension. Without proper control of the infusion rates and doses of electrolytes and medicines for intravenous therapy, it may cause electrolyte imbalances and drug reactions, which lead to several health problems. Insertion of an IV catheter requires skill and finesse. If done incorrectly, for instance, the IV line may be inserted into an artery, which may cause an air embolism and stroke. In other cases, if inserted into the vein, it may puncture the vein causing fluid to leak into nearby tissues. Also, without prior sterilization of the site of venous access or if the procedure is done without proper aseptic precautions, intravenous hydration could introduce bacteria and other infectious agents into the bloodstream, causing infections. What is the best cure for a hangover? Intravenous drips may not be the answer to this the all-too-common question. However, these drips replace fluids and nutrients one loses after drinking heavily, relieving many of the symptoms significantly. However, it helps to be cautious with the use of these fluids. It is important for it to be administered by a health care provider to prevent health complications. The alcohol rehabilitation institutions may also sometimes administer the IV drips. However, they are mostly used for alcohol detoxifying purposes, not to relieve the veisalgia symptoms.